Since the last post, written in May 2008, there have been no submissions of news, events, announcements, or articles by any members. There will be no more posts on this blog. However, the blog will remain here for visitors to enjoy (until Blogger.com "purges" it which they sometimes do with inactive blogs). We hope this post finds you with wonderful tapestries in progress on your looms or an idea for one in the works! The exhibit will be followed by the newsletter, which unfortunately will be very short as there were minimal submissions, and which will also be the last formal newsletter. Upon founding Desert Tapestry Weavers, we had envisioned the group's core focus to be a forum where all members shared their tapestries and their journeys in creating them. From the beginning, we knew we did not want the newsletters evolving to be written largely by us or to only represent the work of a small portion of the members. We had entertained very high hopes that member participation would assist in keeping the group dynamic and viable. With 36 members and 63 readers, the interest is definitely there, but sadly the participation has declined and is not enough to support the publishing of regular newsletters unless we both continue to give more of our time to fill in the gaps, which we cannot do. We would like to extend very sincere thanks and gratitude to those members who did take the time to contribute over the last year and also to the members who submitted works for this exhibit. The Desert Tapestry Weavers site will remain "alive", but it will now function as a forum to announce news related to tapestry. Please feel free to submit news about exhibits, calls for entry, workshops, or publications and we will gladly post them. We would also like to create another "Link" section where we can post member's websites, so if you would like your website included, please send the address to us! 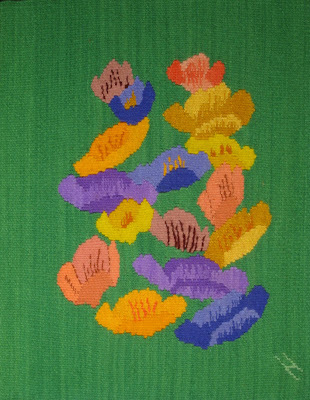 Enjoy this online exhibit of Desert Tapestry Weavers member's works. 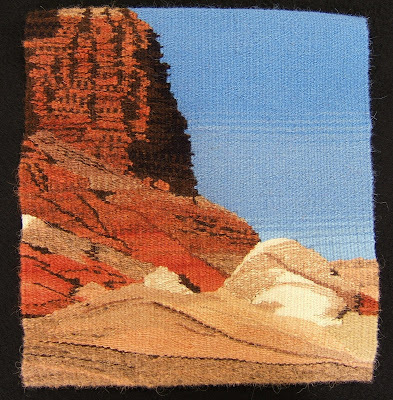 These tapestries embody in part what the phrase Desert Meditations signifies for each artist. "Sandia Winter Sunset" is a study I wove in preparation for a commission for a private collector, who was visiting her daughter here in Albuquerque, New Mexico during the winter of 2007, when we actually had snow. The desert sunset light is amazing here in how it makes the land glow with colors shifting from watermelon to mauves and golden rust tones, bringing out the texture of the grasses. My client shared a number of walks with her daughter in the foothills of the Sandia mountains, which border the eastern edge of Albuquerque, and she wanted a tapestry to reflect not only the magical quality of shifting sunset light, but the strength and character of the mountain as well. As I have been weaving on this commission (to be 30" x 46" horizontal), I find myself engaged in an in-depth dialogue with this high desert mountain, as I describe in tapestry its shadows and cliffs, foothills and grasses. I have always been interested in patterns and systems in the natural environment. Water moves through our lives, often unseen, like warp threads in a tapestry. Disrupt the natural pattern and something else happens, revealing unseen connections, threads and patterns. “Flow” as a tapestry, spent much of it time under the soil evolving into something else, at one time it was under three feet of floodwater. Leaf litter and rootlets were entangled in the threads when it was dug up. It speaks of water that flows, changing as it moves from sky to earth, earth to plant, plant to animal, animal to human, human to artifact: a changing, evolving force that gives a hidden structure to life. "Once There Was a River" is my commentary on the desert - and its limited water supply - being overwhelmed by too many people. I wove it as a triptych to indicate passage of time. 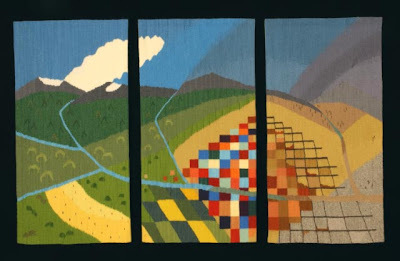 This tapestry was inspired by my first visit to Chaco Canyon and its pre-Columbian ruins of the Anasazi, the ancestors of modern Pueblo Indians. I was intrigued by the openings left in the ruins and the distant views, both real and imagined, from these rough portals. All of Canyon De Chelly is sacred to the Navajo--including Spider Rock, the most dramatic geologic feature of the canyon, believed to be the birthplace of all weaving. My tapestry is of just one location at the bottom of the canyon--one small area full of natural symbols underlying the spirituality of the canyon as the source of an ancient people. "Century Plant in Moonlight" is based on experiences during a recent trip to Big Bend [Texas]. This tapestry was inspired by a digital photo I took while my husband & I were hiking along the base of the Vermillion Cliffs during a trip to the Marble and Paria Canyon areas of northern Arizona. The beauty of the land here mesmerizes. While the elements of earth, air, fire and water are an integral part of every natural environment, it seems that in the deserts of the Southwest one can see, hear, smell, and taste the pure essence of these elements. Pared down to the essentials, these elements no longer exist as part of the landscape; they define the landscape, demanding unwavering attention of our senses. This weaving is part of the “Harriet’s Challenge” project for the Tucson Handweavers and Spinners Guild. 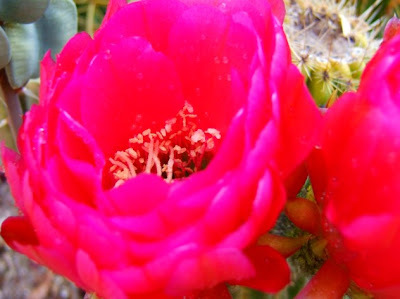 Last year Harriet Rein challenged guild members to create a project that reflected their love of the Arizona desert. Some of my favorite times in the desert are hikes with my husband and dog. The spring wildflowers were spectacular this year and gave opportunity for many wonderful hikes. While hiking my mind frequently “wanders” and projects and creative efforts find a seed among nature. It is also a time to find peace in my life among the many pressures of the world. The colors of the flowers and the general shapes of the flowers were generated from photographs taken by my husband. I used the computer to identify the colors and to change the basic flower shape. This same country is now under the development of the coal mining industry. The open cut method of mining creates deep canyons across the land, and within the canyons there is a deceptively narrow seam of coal visible. markings of the Richter scale, used to measure the magnitude of an earthquake. from the under layers of the earth, forever disturbed and shattered. prominent feature of the landscape. If you haven't checked the sidebar links on this site lately, you should! CTN now has a website up and running. Their latest newsletter is posted, along with a wonderful tapestry slideshow and links to resources. John Jenkins, the wood artisan & owner of Magpie Woodworks, now has a website. He crafts beautiful custom tapestry forks with steel tines (you can even choose the tines per inch - tpi), needle cases, and other fiber related tools. These are noteworthy tapestry blogs... many of the weavers journal about their weaving, their design process, and post photos as the work is in progress. They hail from different parts of the globe, are a wonderful resource and very inspiring. How exciting to have opportunities to see tapestries as they are being woven and to be able to email a weaver to ask questions when something they are doing intrigues you! Make sure to check the links on each of these blogs when you visit them, they will lead to other tapestry & fiber art related sites that are awaiting exploration. For the majority Australians the desert is – ‘out west’. For those who live ‘out west’ the real desert is always further on westwards. For the last few years, while living in Southwest Queensland, I have made brief forays in to the desert in the corner country of southwest Queensland, South Australia, and the Northern Territory. The Simpson Desert is a land that is not what people expect. There is aridity, sand, clear blue-white skies, but there is also gibber plains, trees, food producing plants; even water, sometimes permanent, sometimes only after rain. And there is a record of thousands of years of habitation for those that can read the land and find that water. Everywhere in the desert there are signs of water. In the dry, salty, cracked clay pans that occur in between each 140 km long parallel dune. The small occasional woodlands of stunted and twisted gidgee and coolibah search out water and survive in the dry periods. A waddi tree grove, one of three sites that have been found in Australia also records that somewhere deep in the earth there is enough moisture to support a few trees. The desert is drained by five major rivers that cover one sixth of the continent flowing into Lake Eyre and other salt lakes. These rivers act as a refuge for wildlife, which spreads out into the desert during rain. Once this area was an inland sea. There are clues to this past for those that know where to look. Bounding the somewhat less arid borders to the east and south east are ranges which hide bands of opal bearing rock- the boundary of the land and sea in the distant past. Opal which is 30% water. On the desert edges to the west and south there are mound springs which are like a giant release valve for the Great Artesian Basin, part of which is under the Simpson Desert. This network of springs has in the past provided a network of life support for animals as well as humans. Another source of water from the Basin is Purnie Springs a bore drilled for the oil exploration teams that opened up the desert tracks, and then later abandoned them. This bore (now controlled) runs into a small waterhole that supports wildlife and a welcome rest for travellers. A beautiful campsite with a hot shower, courtesy of the naturally heated fossilised water that comes from deep underground. A pulse of life goes through the country after major rains. To see tyre tracks filled with brilliant small flowers, as flowing water filled them a few weeks earlier is a magical sight. This pulse is repeated on a cosmic scale. The desert landscape is stacked in time. Every hundred thousand years there are glacial/interglacial cycles with the country becoming wetter or dryer with the general trend to increasing aridity. These pulses are like a beating heart that is slowly running down with the warming of the planet. Over the last two years I have worked with the theme of water, and the lack of it, salt, clay and sand, resulting in twelve small tapestries that reflect the arid landscape of Southwest Queensland in particular the two gardens I have established first in Charleville and later in St George. ‘Pulse’ was planted in our St George garden last August around the time it rained for the first rain in months. It took a while to start decomposing, but the waterhole in front of our house had actually received some water and we were able to water our gardens again. it flowed down the dried out cracks in the riverbed and over the surface. You could hear the dry earth drinking it up. It was after this I began the stitching of ‘Pulse’ in December, a lot more rain had fallen, and the river was flowing as I stitched. The unraveled threads and the woven remains developed a rhythm of their own reflecting the rise and fall of the town waterhole as upstream rain flowed down, water was harvested by irrigators for the first time in a couple of years, and environmental flows were allowed to flow on down the system. ‘Dune is a four letter word’ by Griselda Sprigg for a mother’s view of the first crossing of the desert by car. ABC program interviewing people who live or work in the Central Desert. A weaver since the early 1970’s, I began in the New England tradition of pattern weaves and clothing. However, a St. Louis neighbor was Muriel Nezhnie who made certain that local weavers were exposed to tapestry, and an early success came when Francis Merritt, then Director of Haystack, awarded a prize for my tapestry mask and encouraged me to attend Haystack. 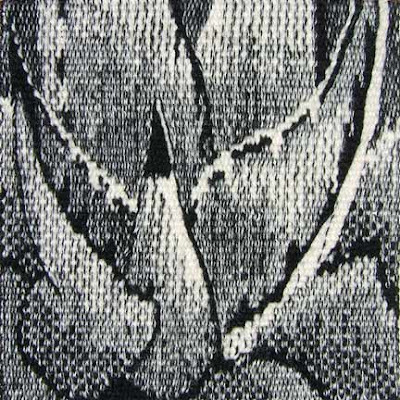 During the 1980’s and 1990’s in Albuquerque I wove Ikat garments and wall hangings in a Collingwood technique called “clasped weft,” both faster and easier to sell than tapestry. For most of the 1990’s I was the adjunct weaving instructor in the Art Education Department of the University of NM, addressing all the basic techniques and all the beginning questions of weaving. With retirement in sight and a need to check my range of weaving skills, I earned HGA’s Basic Level Certificate of Excellence in 1996. For my Master’s Level I focused on the technical choices a tapestry weaver has to make, including a study of techniques used in a number of cultures around the world. I earned that COE in 1998 and retired from regular teaching in 1999. Since then I have critiqued with a number of tapestry friends and worked on the development of an active tapestry group in Albuquerque’s Las Aranas Spinners and Weavers Guild. Presently that group has woven more than 50 small tapestries for a “Doors, Gates and Windows” challenge with the Vancouver Island tapestry weavers; half of those tapestries will be shown in the ATA small format exhibit (Woven Gems) at Convergence. The full show will hang at First Unitarian Church in Albuquerque, 9/7/08 to 10/18/08. 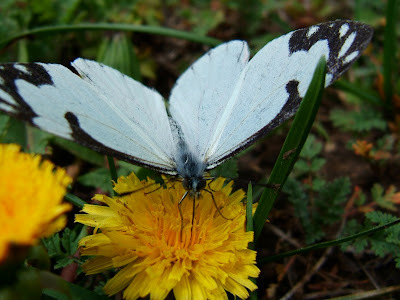 With training both in English teaching and biology, I look to poetry and to the natural world for inspiration. My triptych “Once There Was a River” [in the online exhibit] is a visual commentary on the high desert’s being overwhelmed by too many people. Available in Alpine, Arizona, National Forest campgrounds and at Jane and Don's Blue River Wilderness Retreat. This 2 1/2 day comprehensive workshop shows you how to create a rich palette of beautiful, lightfast and washfast color from natural dyes. We will be using native, cultivated, and imported dye material including plants from Jane's dye garden. She will share her knowledge and methods for producing many shades of color from each dye-pot. You will learn to prepare the dye, to mordant and dye protein fiber (i.e. 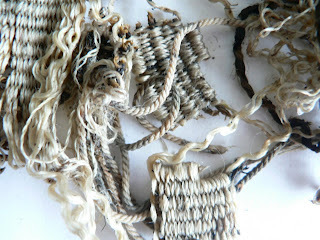 wool, silk, mohair, alpaca), and to experiment with color by using post-mordant baths, exhaust baths and over-dyeing. Come see, feel, and learn how to use Habu's unusual yarns and fibers during their one day visit to the Desert Weaving Workshop. Habu carries unusual and difficult to find fine yarns from Japan and Asia for weavers, knitters, basket makers, stitchers, and artists. Naturally gold colored silk, raw and degummed bombyx silk as fine as 42 denier and up, hand reeled raw and degummed Akagi silks, extra fine silk, wool, cotton or wool/cashmere crepe, hand-tied ramie banana "basho", bamboo, silk & wool stainless steel, paper, hemp bark, etc. are only a few of over 300 selections we have. We offer some special equipment and also "rodin" silk degumming powder. To register, visit the Desert Weaving Workshop website. This workshop is a continuation of study begun in Color and Design I. Exercises in design will include symbolism & the design principles of Form; grid structures, tilings & fractals; and the pliable plane. Color study will focus on the Goethe color system and various optical effects of color. There will be opportunity to weave up to three miniature tapestries based on the design and color exercises. Participants should have basic knowledge of tapestry weaving. Color and Design I is not necessarily a prerequisite. COST: $400. Register before Jan 1 and save $25. A $25 materials fee will provide for warp and weft and a folder of handouts. Scholarships may be available. Let us know if you are interested. This authoritative resource is an expanded, corrected and updated translation of the award -winning book Le Monde des Teintures Naturelles published in 2003 in Paris. To my knowledge, this is the most comprehensive book on natural dyeing currently available. If you are a natural dyer and want to have at your fingertips every scrap of info, including history and chemical structure of the dyes, there is no other book that will give you that kind of info in this depth. A hefty text, it contains an unbelievable amount of content. Dyes are categorized by color, the pictures are outstanding, and it is very enjoyable to read, not dry and boring like many other "technical" manuals. The bibliography alone is worth its weight in gold. Expect to pay close to $200US for this book, but it is worth the cost! The story of the Victorian Tapestry workshop from its formation to 2005. It details not only the pioneering interaction of the Workshop with aboriginal artists but also how the VTW promoted collaborations with noted artists of the times, acting as a springboard that raised tapestry to become considered an accepted, respected, and treasured art form in Australian. The photos are to die for, with many, many wonderful close ups of weave structure and also "historic" photos from the VTW's early years. 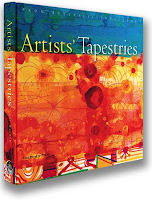 The ultimate "coffee table" book for all tapestry weavers! Also a very large, pricey text, the best price may be found at the Australian website listed above. Tapestry weaving techniques are easy to learn yet often take a long time to master. Along the way to mastery, there are many roads to consider in methods and in design ideas. This class will be about both: the known paths to basics of tapestry technique and the creative meanderings where ideas develop. Collaborations among teachers and students will encourage all to delve into sequence and resolution, tradition and innovation. We will explore ways to find and develop personal concepts and images through which to celebrate the nature of tapestry. Instructors McBride, Scanlin and Williams are long-time friends in fiber; over the past twenty-five years they've worked together in fiber art guilds, workshops, and critique sessions. They are eager to share ideas with others during this eight-week session at Penland, one of the most exciting craft schools in the U.S.
Mixed media artist (commissions: Atlanta's Alliance TheatreCompany, Children's Hospital, Federal Reserve Bank); owner, Globe Galleryin Clayton, GA; grants administrator for state's Grassroots Arts Program; creative consultant for non-profit art organizations. Studio artist; juried member Southern Highland Craft Guildand Piedmont Craftsmen; professor emerita of art, North GA College & StateUniv (GA); other teaching at John Campbell Folk School, Penland (NC), Arrowmont (TN); American Tapestry Alliance award (2007); works included in several public and private collections. Studio artist; juried member Southern Highland Craft Guild; Masters in Art Education; art teacher of fifteen years (public school); American Tapestry Alliance award (2006); exhibited nationally and internationally with tapestry works in private collections. 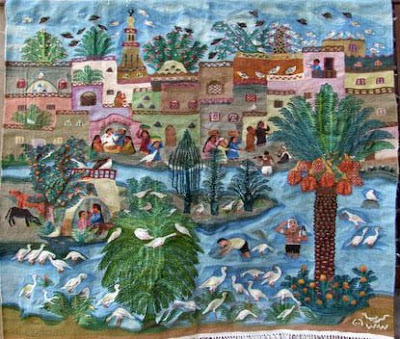 -will investigate the art of tapestry by learning tapestry techniques. 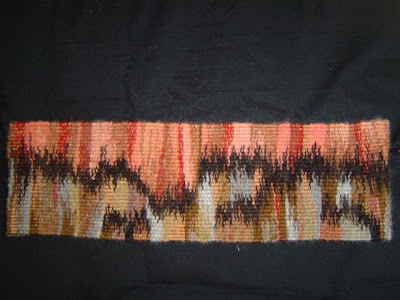 -weave a sampler using basic tapestry techniques. -explore the quality of texture by incorporating a variety of fibers in their sampler. -design methods for planning a tapestry. 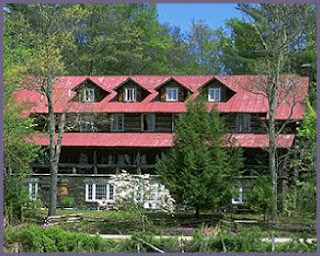 $175 per person - includes breakfast and lunch both days and a tapestry loom for you to keep. Kids 12 yrs and older are welcome (cost for kids is the same to cover materials and food)No special skills or prior experience are needed! Visit this link for more info & registration form! 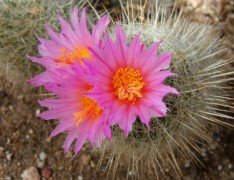 Desert Meditations exhibit deadline reminder! Seasons are changing in both hemispheres of our beautiful planet, and the time is quickly approaching for Desert Tapestry Weavers' 1st year anniversary and our first members' online exhibit! This is a reminder for all members... please consider entering a work that represents your interpretation of the theme Desert Meditations. Also, our first newsletter of the year will be published at the same time, so please consider submitting an article... introduce yourself if you haven't already; let us have a peek of what's on your looms, what you just cut off, or what you are planning; if you don't have a tapestry to submit for the exhibit write about your desert meditations to inspire all of us! The show’s title, Desert Meditations, was selected because it is inclusive of all things desert. Whether you interpret it as a specific thing or place, or as an abstract tapestry reflecting a mood or sense of place, it does not matter. All entries are welcomed. Files are due to Lyn (desertsonghart@yahoo.com) by May 1, 2008 so the show can be posted by our first anniversary, May 22, 2008. We are surrounded by a universe of fluttering moths and butterflies, hovering dragonflies and honey bees, industrious harvester ants and paper wasps, lacy web-making spiders, and a plethora of other insects. Quite simply, as we hustle about our daily routines, we often do not notice the various bugs and spiders that are denizens of our environment. Perhaps they get our attention when we get bitten by one or when they have munched the leaves in our garden. And yet, if we take a closer look at the complex beauty of the six- and eight-legged critters—their artful camouflage, their delicate, iridescent wings—and the various roles they play—as they pollinate plants which feed the planet and loosen and fertilize the soil-- we may gain a greater appreciation of these diminutive creatures. This group exhibit will focus on a wide range of paintings, drawings, jewelry and beadwork, works in clay, fiber, metals, mixed media, and photography inspired by the insects, spiders and creepy crawlies primarily from our region. From realistic renderings to artful fancy, the diversity of artworks helps us all to be aware of and look a little closer at the tiniest creatures in our world and see them a little differently. Tohono Chul Park, where nature, art and culture connect, is a not-for-profit organization located in a residential setting in northwest Tucson. The Park is a 49-acre desert garden with a charming 75 year-old restored adobe building providing space for changing displays. It has an active art and cultural exhibits program and a family-oriented audience. Gallery hours are 9:00 am-5:00 pm daily. Our website is http://www.tohonochulpark.org/. Submissions accepted: through April 8, 2008; No Entry Fee; No limit on number of works that can be submitted. Please print the form below and mail with your entries or reproduce the form and send digitally. Please include short statement about your work as it relates to the theme of the exhibit with your entry form. If works are offered for sale, Tohono Chul pays artist 60% and keeps $40% commission. Works do not have to be for sale. Sales are handled through the Museum Shop. All work must remain on display until the end of the exhibit. Work is insured while on display at the Park.